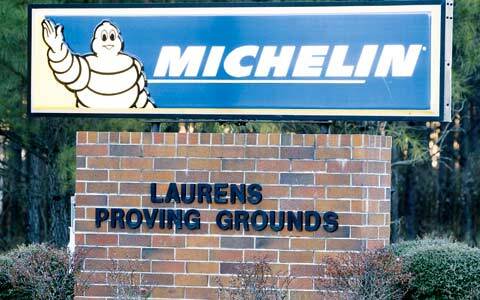 We are having another "skid pad" training session at the Michelin Laurens Proving Grounds facility on their 1/2 mile wet skid pad. Think about the skid pad like this; in distance, the Bristol Motor Speedway is 0.533 mile and the skid pad is .500 mile. It is a very large track with plenty of wet, polished concrete for learning to drift your car. There is a huge run-off area as well, so you have to almost "try" to get into the grass. The past events have been an outstanding success with many drivers learning how to better manage their cars in a skid along with learning the art of "drifting". The cost for each of these participants is $245. This price includes Mike Renner's professional coaching and four hours of track time. There are typically three cars on the track at once which provides many laps and sessions during the four hour window. You can share a car, but the $245 is per driver. Spectators are welcome. Experience is that after 4 hrs on the skid pad you're done. It requires a lot of effort and focus to master it. Space is limited to 12 participants so sign up early so as not to miss this opportunity. We had a wait list last time. Note: This is a wet skid pad so tire wear in minimal. However, on rare occasions if you were to slid off the concrete pad and slid over the sprinkler grate in just the wrong way, a tire could be damaged. Rare, but it has happened. Be sure to use at least minimum rated tire pressures. No cancellations or refunds after Jan 12.